Listen to the words of GuruMaharaj for HIS Adhyatm ...............(Video Clip). How Wonderful! What could be better time than now to cherish those blessed moments that got caught in the recording tool! 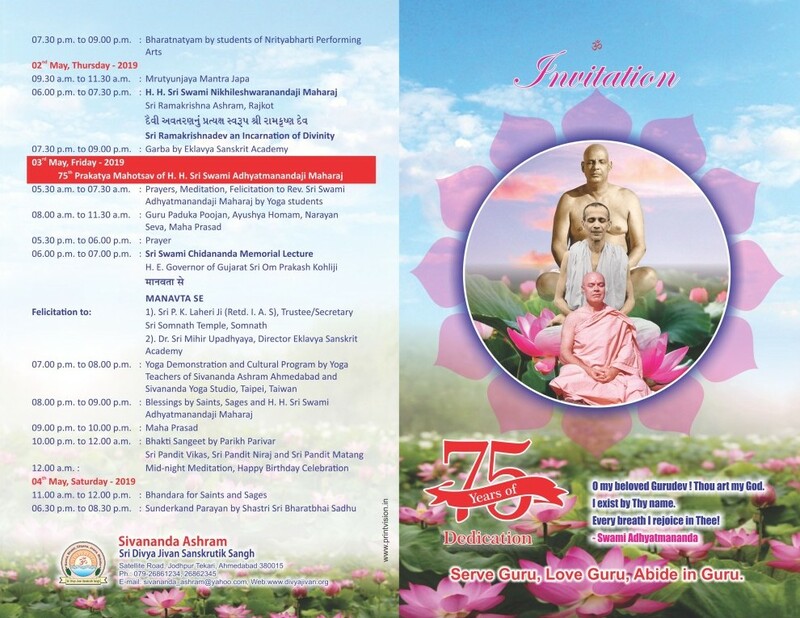 Amrut Mahotsav Year of His Holiness Sri Swami Adhyatmanandaji Maharaj : This year is Pujya Swami Adhyatmanandaji Maharaj's Amrut Mahotsav year (75 th celebration). 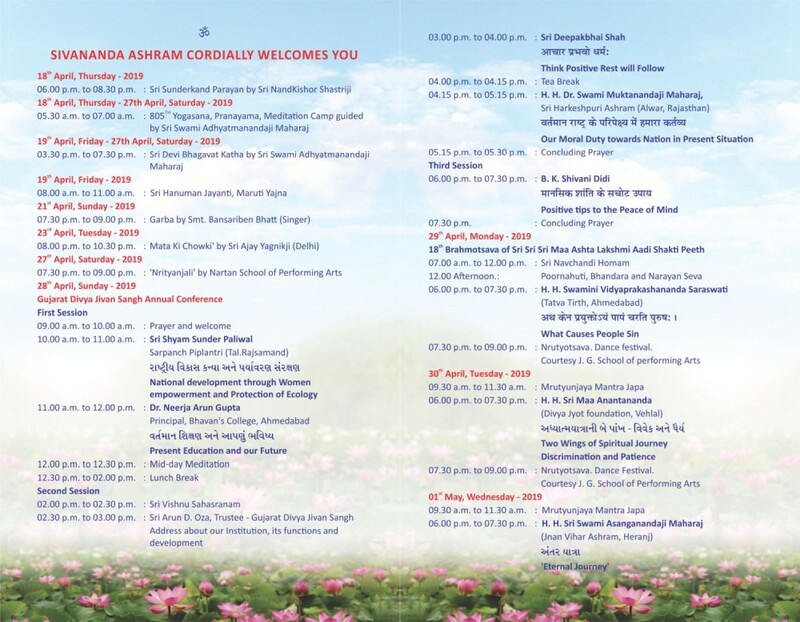 During HIS Amrut Mahotsav year Satsang programs, Spiritual Retreat, Pilgrimage to holy places, Srimad Bhagawat Saptah, Daridranarayan Seva, Anand Utsav at the Ashram, Satsang Tour to the West, Yoga Retreat, Seva Projects and more.... are getting organized by the Ashram. Please contact the Ashram if you wish to invite Pujya Swamiji and arrange satsang programs at your center, temple, yoga group, Yoga studio etc. Be a part of Pujya Swamiji 's Amrut Mahotsv and be benefitted! Srimad Bhagawat Katha at Haridwar ( Oct 31, 2019 to Nov 6, 2019) by H. H. Sri Swami Adhyatmanandaji Maharaj on Vyaspeeth. You are invited to join the group to the pilgrimage to Haridwar for Srimad Bhagawat Katha, please fill out the application form and submit at Ashram's office. 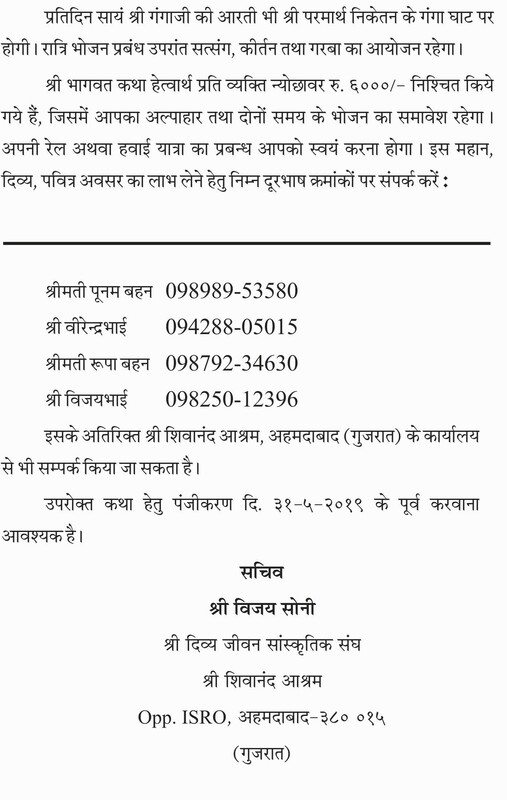 It would facilitate to make travel and stay arrangements etc at Haridwar.... application form. 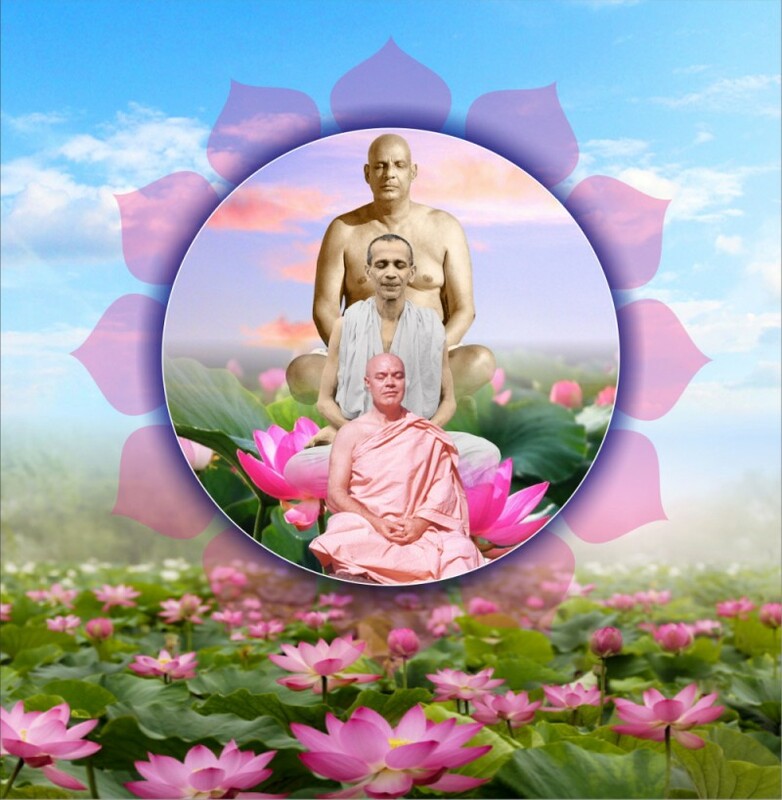 The Divine Life Society was founded by H. H. Sri Swami Sivanandaji Maharaj in the year 1936.H. H. Sri Swami Chidanandaji Maharaj, the disciple of H. H. Sri Swami Sivanandaji Maharaj succeeded as the President of The Divine Life Society in 1963 and He expanded the centers of the society across the globe. H. H. Sri Swami Adhyatmanandaji Maharaj is the beloved disciple of H.H. Sri Swami Chidanandaji Maharaj. Swamiji embraced the life in the Holy order of Sanyas in the year 1974. Since then, under the guidance and blessings of his worshipful Gurudev, he has been the charioteer of spreading the messages of spiritual masters and ancient Holy Scriptures. He has been the President of Sivananda Ashram, Ahmedabad as well as President of Gujarat Divya Jivan Sangh, Ahmedabad. Sri Swamiji is Yoga Guru of global repute. He has embraced service to the humanity above the self through imparting the knowledge of ancient cultural and spiritual heritage of Yogic Science encompassing Asanas; Pranayama and Meditation. So far Swamiji has conducted over 796 Yoga camps of 10 days duration across the globe. Swamiji renders talks on various subjects on All India Radio over the past six decades. His Yoga lessons and interviews telecast across various TV channels. HE has greatly contributed Yoga teaching on TV channels over five decades. Swamiji has designed Yoga Teachers’ Training Course (YTTC), a comprehensive 20 days residential program for training of Yoga teachers which is conducted twice during the year since two decades. He has conducted more than 40 YTTC programs which is recognized by Gujarat University. These programs are attended by yoga aspirants from across the globe and he has trained more than 1000 yoga teachers. These teachers render both preventive and curative aspects of yoga teaching for well-being of body and mind across humanity around the world and are instrumental in spreading ancient Indian Culture and rich heritage. A Yogi and an angel, neck deep in service of humanity, His services to the nation through his yoga camps in the universities, colliery mines, Indian armed forces, Indian administration services not only in the planes but also at Leh (Laddakh), Kargil, Punch etc., has given him a great satisfaction of his Karma Yajna in uplifting the individual beings through the dissemination of science and yoga of synthesis. Swamiji has been speakers on various forums at national and international organizations on management, Yoga and applied Science for stress management and self-improvement subjects. To name few institutions like Ahmedabad Management Association; Sardar Patel Institute of Public Administration; Lions and Rotary clubs at international level. His life is tireless strife for perfections. He is always eager to serve the mankind known and unknown. An icon of inspiration and service to Youth, Swamiji's profound contribution to modern youth to free them from the vices of the drugs addictions in the east and the west has brought Him in great light. The saint with sympathy, kind heart and holy touch has shown these youngsters a dawn to their doomed life. Swamiji's discourses on ancient Holy Scriptures and spiritual deliveries on the subjects of Gita, Upanishads, Srimat Bhagavat are in simple and lucid language which has touched and inspired millions during last thirty five years of his monastic life. Swamiji is great missionary on blood donation front and affirms his faith in “Donate blood and save life”. Swamiji was honored by the Governor of Gujarat as centurion blood donor. During diamond jubilee celebration of Swamiji, for his love and compassion for poor, sick and down-trodden, He organized 230 blood donation camps and inspired 69,542 blood donors who collectively contributed 20,862 liters of blood. Blood Donation is integral part of His spiritual retreat & amp; yoga camps. Swamiji has great love for plants and trees. He serves society selflessly but in exchange solicits to gift Him plant for ecological balance of the planet Mother Earth. He affirms his deep faith that mindless exploitation of mother earth and vitiating environment through pollution is the root of natural disasters and many human diseases besides threat to millions of animal species. Swamiji has planted more than 10 million saplings and plants on this planet and has rendered great service to Mother Earth for ecological balance. His book “Gita Navneetam” in Gujarati literature is awarded “Maharshi Arvind Gold Medal” by Gujarati Sahitya Parishad in year 2003. Global accolades and awards: He represented India for World Peace conference at Chiapas, New Mexico in 1999. He is a recipient of Life Time Achievement Award from India Canada Cultural and Heritage Association Inc. at Winnipeg, Canada 2005. He is honored with “Ambassador of Peace” award by Universal Peace Foundation in 2008. He was instrumental in organizing first vegetarian conference at Beijing, China in 2009. Swamiji has widely traveled across world visiting several countries for teachings of Yoga and delivering discoursesfor spiritual seekers on our ancient scriptures for spreading of message of Vedant; Gita; Upnishad; Bhagavat and Self Improvement topics. 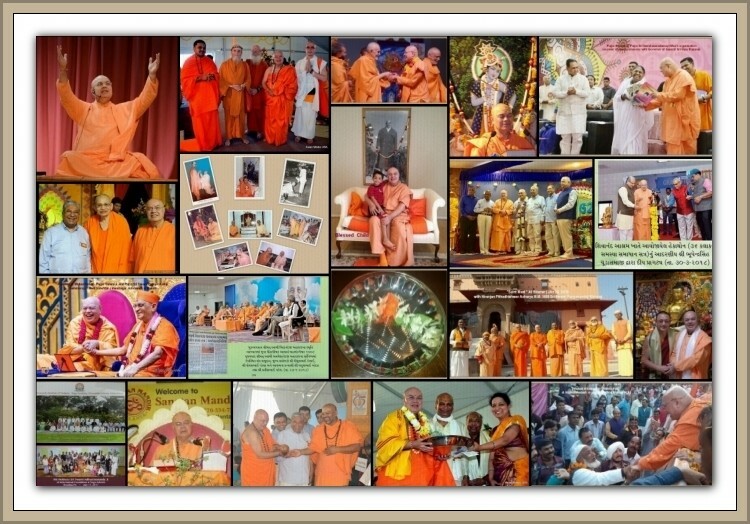 Swamiji has traveled viz; USA; Canada; United Kingdom; Germany; Mexico; Singapore; Malaysia; China; Taiwan; South Africa etc. on invitation from several institutions. Swamiji is interviewed by various Radio / TV medias; news channels and has rendered there talks on Yoga for physical; mental and spiritual wellbeing of mankind. Swamiji represented India for World Peace conference at Chiapas, New Mexico in 1999. He is a recipient of Life Time Achievement Award from India Canada Cultural and Heritage Association Inc. at Winnipeg, Canada 2005. Also he has been awarded as “Ambassador of Peace” by Universal Peace Foundation in 2008. He organized first vegetarian conference at Beijing, China in 2009. Institute of Science & Technology, New Delhi awarded HIM the title of " GEM of India" in the month of August 2016. HIS Excellency Honorable Governor of Gujarat, Om Prakash Kohli has presented HIM the title of "Glory of Gujarat" in the month of January 2017 on behalf of Indian Council of Social welfare (ICSW) Gujarat state branch. This award is given to HIM for HIS dedication and distinguish contribution in the field of Yoga, Meditation as well as for spreading the Religious, Cultural and Spiritual Awareness. Swamiji's Publication : His books on Yoga and Spiritual Science: Swamiji over a period has written several books on Yoga and Spiritual aspects of life in Gujarati; Hindi and English. His book on “Yoga a way of Life' is translated in Russian language. Books published in Gujarati: “Yog ej Jivan”; “Yog Ane Swasthya” (In Gujarai as well as in Hindi); “Yog Nidra”; (In Gujarati and Hindi) “Yog Ane Arogya”; “Jivayog”; “AdhytmaAmrut”; “Adhytma no Anand”; AmrutDhara”; “AdhyatmikRatno”; “Anandoham”; “Atma Darshan; “Prkash Path”. Books published in English: “Yoga a way of Life”; “Yoga and Health”; “Yoga for better Living”; “In tune with Infinite” “Gita Navnitam” (Translated from Gujarati).